Women of the World believes in the power of stories: to heal, to detail our humanity, and to hope. In Clemantine Wamariya's story of seeking refuge (she fled Rwanda at age six with her elder sister) and resettlement (eventually in Chicago), we get all of this and more, a courageous voice that is a force to be reckoned with. Women of the World is working together with Crown Publishing to have a Skype question and answer forum with Clemantine and her co-author Elizabeth Weil. It is especially exciting for Women of the World to support the burgeoning career of a young, female refugee writer as so many of our ladies have expressed an interest in sharing their stories. Please continue to stay-tuned to Women of the World's Facebook page for more details on events with Clemantine. When Clemantine was twelve, she and her sister were granted refugee status in the United States; there, in Chicago, their lives diverged. Though their bond remained unbreakable, Claire, who had for so long protected and provided for Clemantine, was a single mother struggling to make ends meet, while Clemantine was taken in by a family who raised her as their own. She seemed—at least on the surface—to live the American dream: attending private school, taking up cheerleading, and, ultimately, graduating from Yale. Yet the years of being treated as less than human, of going hungry and seeing death, could not be erased. She felt at the same time six years old and one hundred years old. 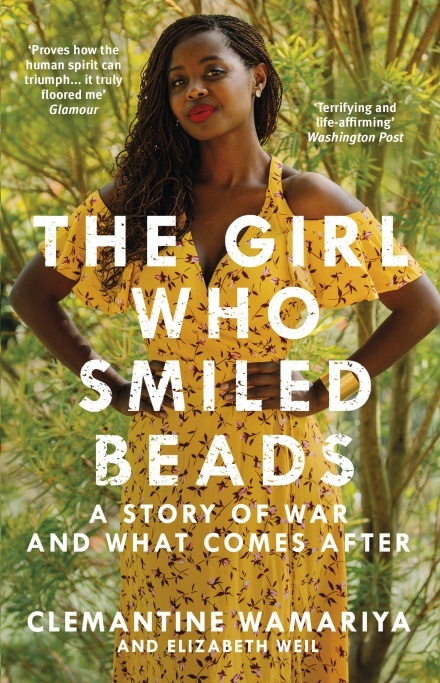 In The Girl Who Smiled Beads, Clemantine provokes us to look beyond the label of “victim” and recognize the power of imagination to transcend even the most profound injuries and aftershocks. Devastating yet beautiful, and bracingly original, it is a powerful testament to her commitment to constructing a life on her own terms.